Instagram is becoming quite a big ecosystem and every marketer should really consider it for their strategy. In fact, I’ve just read a study that claimed Instagram has the potential of overtaking Facebook but as for now, they have a long way to go. However, Instagram has something that Facebook doesn’t. – An organic reach that is quite good. Facebook’s organic reach has done nothing but decline over the years, which leaves brands with really just one option to get good marketing results on the platform: pay for marketing. Thankfully Instagram hasn’t gotten quite that saturated yet that you are happy if you get merely 1 percent engagement. Followers on Instagram are a vital part of getting your content seen. By getting more followers, more people will get your content in their newsfeed, the higher engagement you’ll get, and the better marketing results you’ll get long-term. When working with Instagram and implementing it in your marketing strategy, some of your main goals are to grow your audience, increase your reach and create valuable relationships. Although we won’t go through all of the mentioned steps in this article, the first one is really the foundation of all the other Instagram results. While it sounds simple, you need to have a strong strategy, and a lot of tricks up your sleeves in order to find success on the platform. Therefore, in this article, I’ll present you with Helpful Tips To Grow Your Instagram Following. I’ve been using in my own Instagram approach. I currently run 6 Instagram account that ranges from 20K to 350K followers. If you have a blog or are using Twitter, Facebook, Snapchat, or any other social media platform, you will want to broadcast and amplify the fact that you’re also on Instagram. If you have a built up a major following on any of the mentioned platforms, you’ll get even better results, and will be able to quickly grow your Instagram followers with a simple, informative message. For example, take a screenshot of your Instagram account and share it on Facebook along with a link to your Instagram page. Or simply share your Instagram username in the post and ask your followers to follow you. Your most loyal followers will do it in a heartbeat, and you might be able to convince some other people as well. Emojis are the universal language on Instagram. In fact, Instagram reports that nearly 50% of all captions and comments on Instagram now have an emoji or two in them. Because emojis are searchable on Instagram as both a hashtag or in your username, people can find you based on which emoji you use. Also, emojis help your content stick out because as opposed to long boring captions, emojis are something that catches people’s attention. Last but not least, emojis are a great way to show your brand’s personality. Of course, not all brands will be able to use emojis, simply because their audience don’t, and using them would only make the gap between brand and customer greater. But if you can – use them. You’ll see an increase in engagement and ultimately followers. Instagram is akin to a digital magazine, so curate content that shares a similar theme or vibe. For example, crop all of your images the same way, post pictures of the same subject matter, or use the same filter on all of your photos. This will make your content easy recognizable and you’ll be considered a trendsetter and a unique profile on Instagram which often attracts a lot of new followers. 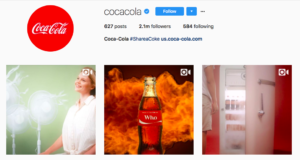 It’s very clear what color Coca-Cola wants you to associate their brand with. For example, crop all of your images the same way, post pictures of the same subject matter, or use the same filter on all of your photos.This will make your content easy recognizable and you’ll be considered a trendsetter and a unique profile on Instagram which often attracts a lot of new followers. This will make your content easy recognizable and you’ll be considered a “trendsetter” and a unique profile on Instagram which often attracts a lot of new followers. The best part is that being unique and having your own style, people will start to replicate you. Thankfully, there can be no one like you, and you’ll be remembered as the “creator” of that particular style. 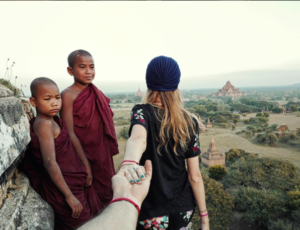 Murad Osmann is the creator of the “Follow me to”-styled images. After the creation of them, an incredible number of people have replicated his style of images, however, he’ll always be remembered as the founder and “inventor” of it, if you may. The right hashtags can expose your images to a large targeted audience. You can add up to 30 hashtags, and interactions are highest on Instagram posts with 11+ hashtags according to a study by Bee visible. How many tags you should really use has been discussed quite a bit, but as the more hashtags you use presents your post in more places where your post can get seen, the most reasonable truth would be that the most hashtags you use, the broader reach you’ll get. Quality is more important than quantity when driving in visitors to your post. Therefore, you don’t want to use the most popular hashtags, because these are heavily used by bots, thus leading to you almost solely getting bot interactions if you use them. Instead, you want to look at using hashtags that are relevant to your niche so that people who are genuinely interested in what you have to offer fits your content. You can use Hashtagify to find hashtags that are relevant and related to your business. Simply type in a major hashtag from an already popular post and see which of the resulting related hashtags you can add to your post to bring in new traffic. A tip is to create a few different sets of hashtags that you can change between based on the content you are sharing. It’s important to go back through your photos periodically to see which posts got the most likes and comments. This helps you serve up more of what your followers are interested in and weed out the types of posts that don’t perform well. Obviously, you are creating and sharing content for your audience, and therefore, you want to try and understand what type of content your audience likes in order to post more of that. If you can fine-tune your content sharing to perfection, you’ll end up sharing content that all of your followers like all of the time. unfortunately, we don’t live in a perfect world, and it is impossible to please everyone. Aim on learning what the majority of your followers like, then tweak your current content strategy to better suit your audience’s preferences.